In Part 1 of this two-part series, ANA Synchro defined the terms used to describe our sport’s most basic moves. In this final part, we define competition and performance-related terms. Routine - a choreographed sequence of moves that a swimmer performs to music. Routines can feature one swimmer (solo), two swimmers (duet), three swimmers (trio), 4-8 swimmers (team), or 8-10 swimmers (combo). Combo - a special type of team routine featuring 8-10 girls that is choreographed to showcase a blend of traditional team swimming and small routine swimming. Any combination of the 10 swimmers may perform different parts of a combo, which opens up some neat possibilities for story-telling and choreography and makes combos both interesting to watch and challenging to perform. Combos used to be done rarely – only at particular meets that allowed them. 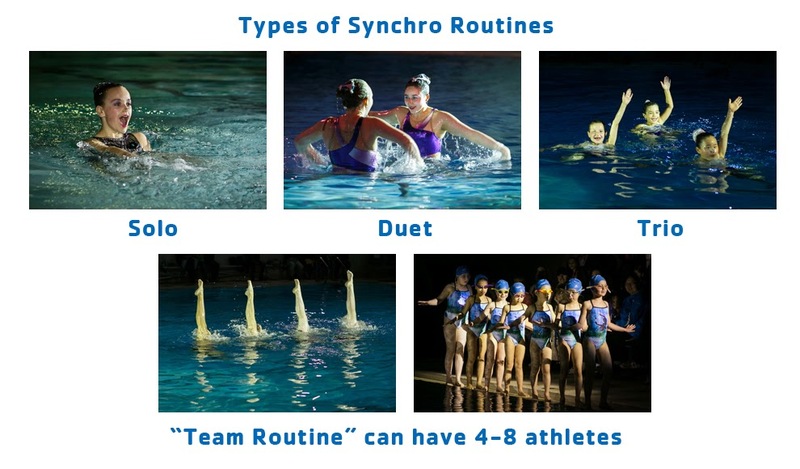 But USA Synchro has added combos to the Junior Olympics (the new name for the age group national championships), so more teams, including ANA Synchro, will now be doing them. Walkout & Deckwork – refers to how the athletes walk out onto the deck when it is their turn to swim at a competition and the pose they strike on deck. How a team walks out and their deckwork are not usually judged, but it is the first opportunity for athletes to show judges who they are as a team. Therefore, the athletes will choreograph and practice it just like everything else to make it as impressive as possible. Deckwork is limited to 10 seconds, and all athletes must maintain contact with the deck with at least one extremity, but other than that, teams can be as creative as they want. 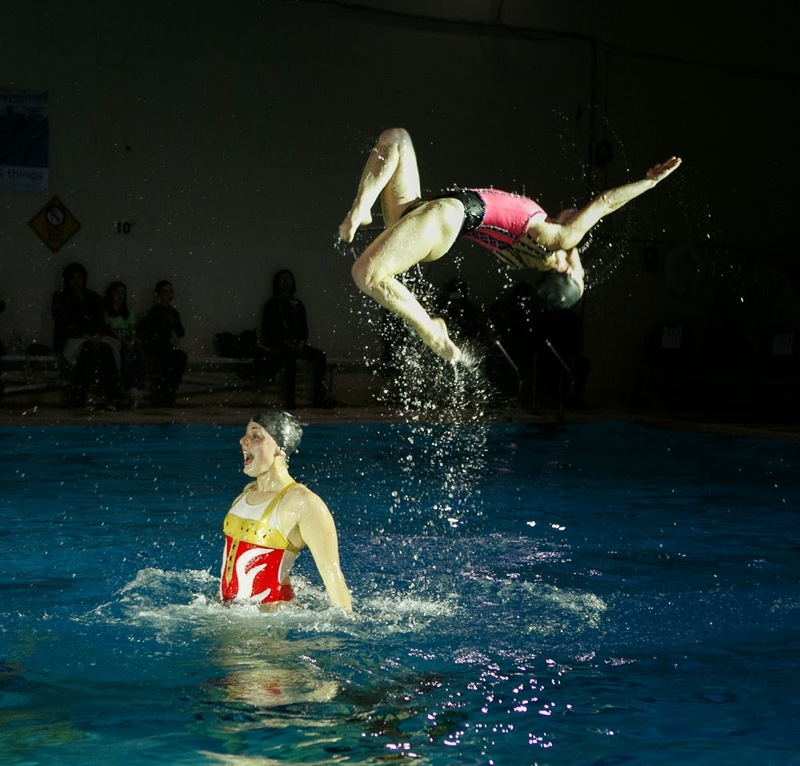 Pop-Up, also known as Boost - the move when a synchronized swimmer uses her strong leg muscles to propel herself straight up out of the water (without touching the bottom of the pool, of course!). Judges look for how high the athletes get out of the water, along with how much control they maintain throughout the move. Lift - an exciting move where one athlete is lifted out of the water by her teammates who are still underwater. A lift can be stationary, where the athlete on top remains in contact with her teammates throughout the move, or it can be a “throw lift” where she actually launches away from them, allowing her to dive, flip or do some other move to thrill the judges and the audience. Head Coach Leah Pinette demonstrates a back flip at last year's annual show! Base - anyone underwater, at the bottom of a lift. Girls who take a turn as a base quickly learn the strength and coordination needed to propel someone out of the water, all without touching the bottom of the pool! Flyer - the person on top of a lift. Our own Head Coach Leah was the “flyer” for our USA National Team, which meant she routinely did back flips and other exciting moves. Athletes interested in being a flyer often do additional specialty gymnastics training to learn and perfect the acrobatics. Coach Leah wants all the older girls to learn how to knox themselves (left). First-time knoxer (right). Knox - the gel-like substance in the swimmer’s hair to keep it in place during a routine performance. The swimmer’s hair is put up into a tight bun and then secured with bobby pins and a hairnet. Knox is prepared by mixing packets of unflavored gelatin with hot water to make a gel, which is then combed into and painted onto the hair. ***Pre-team members do not have to knox! *** Intermediate and Age Group athletes knox for all meets and the show. A routine's music will often inspire the design of the suit. The duet on the left swam to "Sailor" music, and the team on the right swam to the pirate-themed music from "Hook." Routine Suit & Headpiece - a swimsuit, often decorated with glitter and gems, that a swimmer wears during a routine performance or competition. Routine suits are designed to match the routine’s music selection and choreography, so they can help tell the story. A matching headpiece is typically worn around the bun to complete the look. The coaches welcome input from creative swimmers with ideas for routine suits! We even did a blog entry on this very topic! Are there more synchro terms you wish you knew more about? Email us at synchroana@gmail.com or write your ideas in the comments section below, and we’ll try to feature them in an upcoming blog!